This card started out with the Sahara Sand frame that I'd made for this card and then replaced with a different colour. I simply cut a piece of the gorgeous Delightfully Detailed Laser Cut paper to size and glued it to the back of the frame with the white side of the paper showing to the front. I adhered the frame to the base card of Basic Gray. 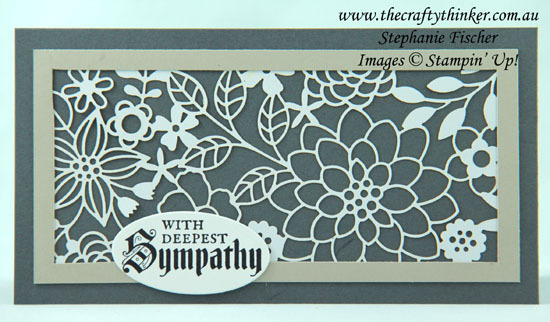 The sentiment is from the Painted Glass stamp set and I cut it out with one of the Layering Ovals framelits.